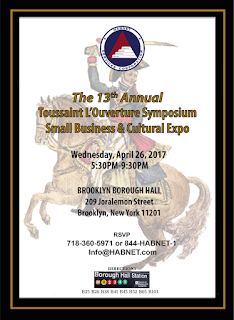 The Toussaint L’Ouverture Symposium & Small Business Expo is organized by HABNET every year since 2005. It is an educational, cultural and recreational program held every April that involves discussions about the historical achievements of Toussaint L’Ouverture and his impact on the United States. The program promotes cultural pride and creates cultural understanding between the people of the United States and Haiti by emphasizing the historical relationship between the two countries. It is also a celebration of the co-naming of Nostrand Avenue to Toussaint L'Ouverture Blvd. Finally, it is recognition of business leaders and others who exhibit the L'Ouverture principle emphasizing the importance of civics and economics. During the Symposium, vendors are afforded the opportunity to network with participants and showcase their goods and services. At the Symposium you will enjoy exotic cocktail, a delicious meal, opportunities to network with VIPs, win gift prizes and more.